Faith and Freedom Daily: Franklin Graham: A Voice Crying in the Wilderness? 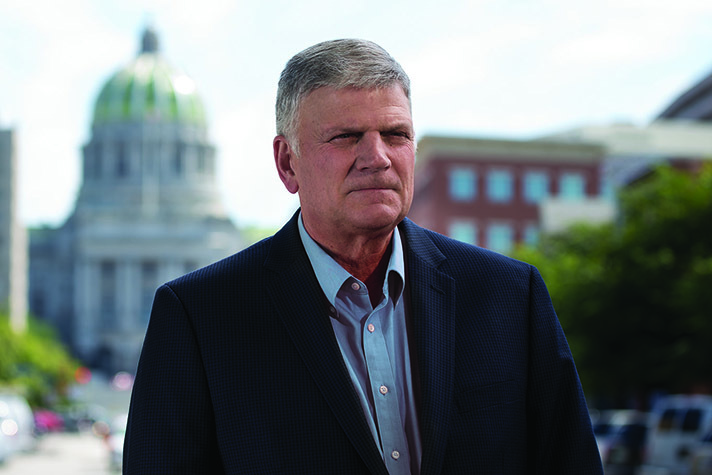 Franklin Graham: A Voice Crying in the Wilderness? Franklin recently wrote, "I believe we are perilously close to the moral tipping point for the survival of the United States of America." "And," he wrote, "I refuse to be silent...and watch our children and grandchildren be offered up on pagan altars." Certainly the cultural "elites" seek to dismiss and marginalize him and his message; But Franklin says while many of the older pastors understand the gravity of our times, too many of the younger pastors do not. It has been said by some he is out of touch---"a voice crying in the wilderness." The first chapter of John tells us that when the religious leaders confronted John the Baptist asking, "Who are you?" he made it clear he was not the Messiah, but was preparing the way for Him who would come. The scoffing could be heard all the way back to Jerusalem. When asked, "What do you say about yourself?" he replied (v. 23), "I am the voice of one crying in the wilderness," quoting Isaiah 40:3. In context, John was describing the condition of the culture, not the effectiveness of his message. But because the religious leaders rejected him personally, and his message, the label of one "crying in the wilderness" has evolved and suggests in our "enlightened" times, and to "enlightened" people that John's message represents one that is out of touch---marginal. Franklin wrote in Decision Magazine, "I believe we are perilously close to the moral tipping point for the survival of the United States of America. I refuse to be silent and watch the future of our children and grandchildren be offered up on pagan altars of personal pleasure and immorality." He wrote, "There now exists deep-seated antagonism and hostility toward Christianity in the very seat of power in this nation---government, media, courts and education. It has become open season on Christians." The only hope for America," Franklin says, "is not the Democratic Party and it's not the Republican Party. The only hope for America is God." In the attempt to discredit Franklin and his message, some in so-called mainstream Christianity and the religious Left constantly try to "wildernessize" him. One example: Eliel Cruz, a columnist considered to be "elite" and "informed" by the religious Left, wrote in the Religious News Service how very out of touch Franklin Graham and his message is in today's world. Last Summer, Graham moved the ministry accounts of Samaritan's Purse and The Billy Graham Evangelistic Association out of Wells Fargo because of their TV ads that featured homosexuals. Eliel Cruz goes to great lengths in making the point that nearly everyone now supports so-called "gay marriage," therefore affirming how "wilderness-like" Franklin really is. Cruz ends his article in the Religious News Service with this: "Soon, Graham might have to stash his cash under his mattress, send smoke signals and grow his own food." Note the comments posted at the end of Cruz's column. The young pastors that Franklin references are not mean spirited, but, I believe, equally misled. Franklin told Todd Starnes, "The younger pastors---so many are caught up in the pop culture, and the pastor in a church is more about being cool. We're beginning to put theology in the backseat and I'm concerned about the church." In mentioning young pastors who are caught up with the pop culture, Franklin is referring to what has become known as "Hipster Pastors." I am sensitive to this because some of the "hipster pastors" who have become nationally known are the sons of pastors with whom I have been long time friends. Chad Veach, formerly on staff with Judah Smith and The City Bible Church in Bellevue says he is "committed to new ways of sharing the Gospel's relevancy with today's youth." I'm all in regarding new ways of sharing the Gospel as long as the Gospel is not revised to fit more comfortably into a culture that believes there are no absolutes---no right or wrong. Veach says people who resist change do so because "they are in love with their method and are not willing to change." However, as the article continues, Veach says, "What got us here, is not gonna get us there." He says he, Rich Wilkerson, Jr., Carl Lentz and Robert Madu believe "the Gospel is not tired, but people are tired of tired presentations of the Gospel." Agreed. New and innovative ways of presenting the Gospel are not anti-Gospel. But in some cases, failure to present the whole Gospel may create a crowd, but does not necessarily reflect changed lives---nor is it true to the Gospel. Veach, unfortunately, was speaking for too many other young pastors when he explained, "I think when we shine a light, we don't have to tell darkness how dark it is, so I don't have to address all these peripheral issues when the Gospel is the main issue." For example," he said, "Rich Wilkerson, Jr. and I and a lot of our friends, we try to shine bright in dark spaces, and we don't go around telling them how dark they are or address these issues...God will do the rest." He says God will deal with "issues of the heart" and "lifestyle stuff"---"I don't even think it's our jobs to go off on tangents and get ourselves in trouble..."
The New York Post published an article featuring Carl Lentz, pastor of NYC Hillsong Church, titled, "Justin Bieber's Hipster Pastor: I'm Praying For This Boy To Make It." Lentz says, "I am not a life motivational guy," but is praying for and befriending Justin Bieber. There is no more effective way to share the Gospel than personally in a friendship relationship. However, if the whole Gospel is not shared, are we giving people a true picture of the Truth? Truth that sets them free? And if the "peripheral issues" that these and other young pastors are avoiding to "stay out of trouble" are the issues of our culture, can we as pastors of any age be silent? "To be honest with you," Franklin Graham said, "the problems we have in America today are the failure of the church." While it may be "hip" to avoid speaking to the so-called "peripheral issues," is this who Christ has called us to be? Is this the Gospel that was delivered through the Cross and the Resurrection? As the Priests and Levites from Jerusalem asked John, in a condescending way, who he thought he was, too many "elite" religious leaders today are quick to try to marginalize anyone who tells it like it is in 2016. I understand it is more acceptable to skip the sin and lifestyle issues, but is that the Gospel we are called to preach? Are we not called to proclaim the Gospel to be the "Power of God unto Salvation"---the answer to a broken nation as well as to a broken individual? The true path to restoration. Franklin points out, "The churches have allowed the government to take away their responsibility and so the government is feeding people, the government is clothing people, the government is now in charge of health care." And I would add, the churches are allowing the government to take away our religious freedom, while we stand quietly by. In many ways the church has become subservient to the government rather than to the God who created it through the death and Resurrection of His Son Jesus Christ. In doing so, as Franklin rightly notes, "The culture is perilously close to the moral tipping point." Indeed it is. And there is significant responsibility placed in the hands of the New Testament church to speak the Truth, in love. This is why Franklin will be holding prayer rallies at the capital of every state prior to the November election. Be Faithful. Be Vigilant. Be Discerning. Be Prayerful. Hipster pastors are starting to spectacularly fail. Mark Driscoll, and so many others, leaving behind them a trail of broken hearts, and lives not based on the eternal foundation of the Ancient of Days. These hipster pastors are just men, and women like all of us, and their charges put way too much faith in them. If you're in a church like this, pray for them, and speak the truth. Stand on the Word. Jesus did not shrink back from speaking the truth in love, and neither should we. Jesus called out adultery, greed, avarice, prayerlessness, and many other sins directly, and we starting with our own lives and starting in the church, and led by the Holy Spirit need to do the same. The result of calling people to the Holy God, is always transformation and revival od the Church. Pray and seek revival for America's churches. Pray with your pastors, pull them into prayer. As EM Bounds wrote, a praying pulpit, will beget, a praying pew. Oh what we need today are praying Christians in the churches leading to great renewal. This will lead more people to Christ than any hipster movement ever could. I really want to be there praying with Franklin Graham when he comes to Washington. I have been praying for my country for a long time. I pray with my grandchildren as well. I hope we can all show up. As mature Christians, we have left two churches that refused to uphold Biblical standards. It is very difficult--leaving your family, choir, Sunday School teaching,etc. It did not shake my faith in the least, but I fear for the new Christian and those who are just seeds newly fallen to the ground. Will they survive to produce fruit? This is the church's responsibility.